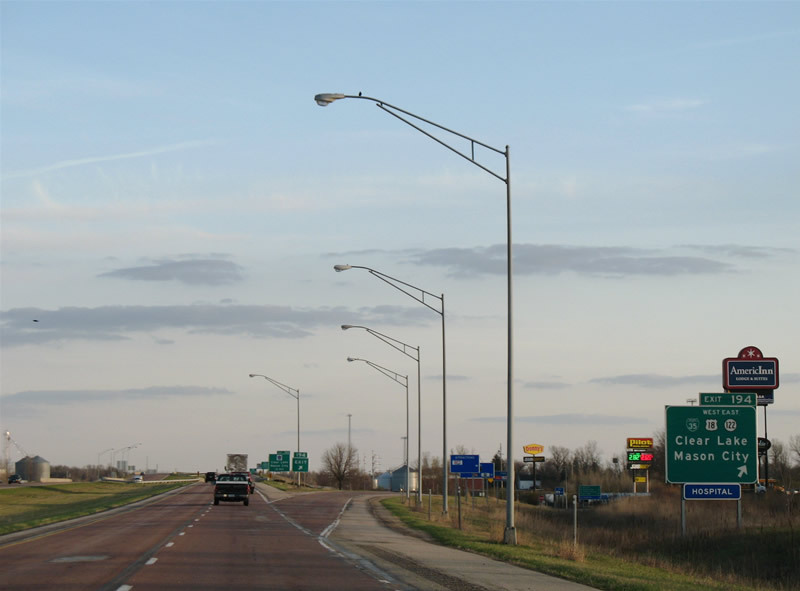 Interstate 35 has 15 active business routes posted in Texas, Missouri, Iowa and Minnesota. Several were proposed for both I-35 and I-135 in Kansas, but disapproved by AASHTO in 1979.
Business routes for Interstates in Texas are state maintained and inventoried in the TxDOT Texas Highway Designation Files. Mileage statistics and establishment dates posted below were obtained from these. Business Loop I-35A originates south from the IH 35 southbound off-ramp (Exit 3B) to San Bernardo Avenue. San Bernardino Avenue (old U.S. 81 / U.S. 83 Business) forms a frontage road to the freeway south until the IH 35 eastward shift at Calton Road (Exit 3A). The Business Loop stays one block west of Interstate 35 to the southern terminus, where the freeway separates into the couplet of Santa Ursula Avenue south and San Darion Avenue north at Victoria Street. Business Loop I-35 travels a series of one-way streets from the couplet of Houston Street west and Matamoros Street east through Downtown Laredo. The route southbound takes Houston Street west four blocks from San Bernardino Avenue to Salinas Avenue south. Salinas Avenue continues the route to Zaragoza Street, which flows east one block to Convent Avenue north as it exits the customs facility from the Americas International Bridge. Convent Avenue (old U.S. 81) leads Business Loop I-35 north back to Matamoros Street, which returns the route east to IH 35 via San Dario Avenue north. Business Interstate Highway Number 35-A was established on August 23, 1991 at a length of approximately 4.0 miles. The 2.8 mile section along San Bernardino Avenue was transferred from U.S. 83 Business. Designated internally by TxDOT as Interstate Highway No-35B, the 1.22 mile route through the city of Encinal follows old U.S. 81 along Main Street between Exits 38 and 39. 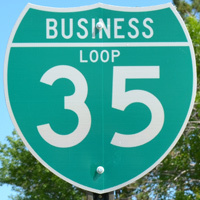 A mileage transfer from State Loop 532 took place on June 21, 1990 to establish the business loop. The Cotulla business route from I-35 loops east from Exit 65 along Main Street (old U.S. 81) to the city center, and north to Exit 69. 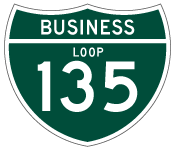 The 3.1 mile route was designated as Business Loop I-35C when it was created on March 26, 1991. Traveling 4.15 miles, Business Loop I-35D bee lines north along old U.S. 81 (Main Street) from Exit 82 to Exit 86 as IH 35 bypasses the city to the west. 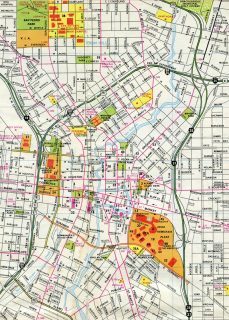 The business route was created via a mileage transfer from U.S. 81 on March 26, 1991 as part of the truncation of the US highway south of Fort Worth. Interstate 35 circumvents the Frio County seat of Pearsall and neighboring West Pearsall to the west. Business Loop I-35 provides a direct route to the city center from Exit 99 northeast along overlaps with FM 1581 and FM 140 (Comal Street). Overtaking old U.S. 81 along Oak Street, the business route advances northward by West Pearsall to end at Exit 104. The 5.45 mile loop was designated on March 26, 1991, partially with a mileage transfer from U.S. 81. 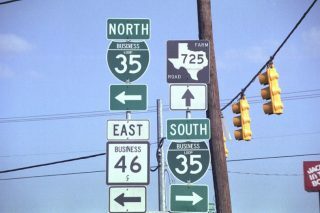 Prior to the 1991 decommissioning of U.S. 81 south of Fort Worth, old Laredo Highway was known as U.S. 81 Business between Exits 145B and 154A through southern San Antonio. A second business loop for U.S. 81 was also posted along old Austin Highway between Exits 158 and 166 through northern San Antonio. 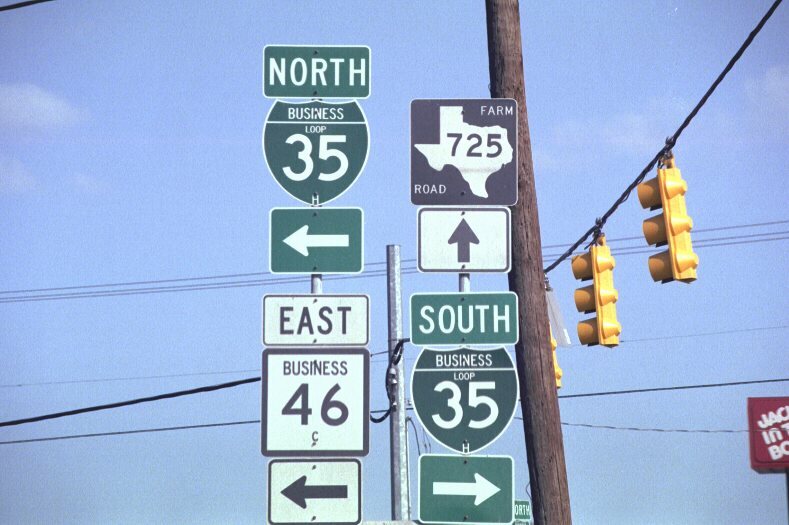 The southern business route was renumbered as Texas Loop 353 while the northern section became Texas Loop 368. Neither route was assigned Business Loop I-35F or I-35G respectively. Some maps also showed a business loop for IH 35 encircling the San Antonio central business district. 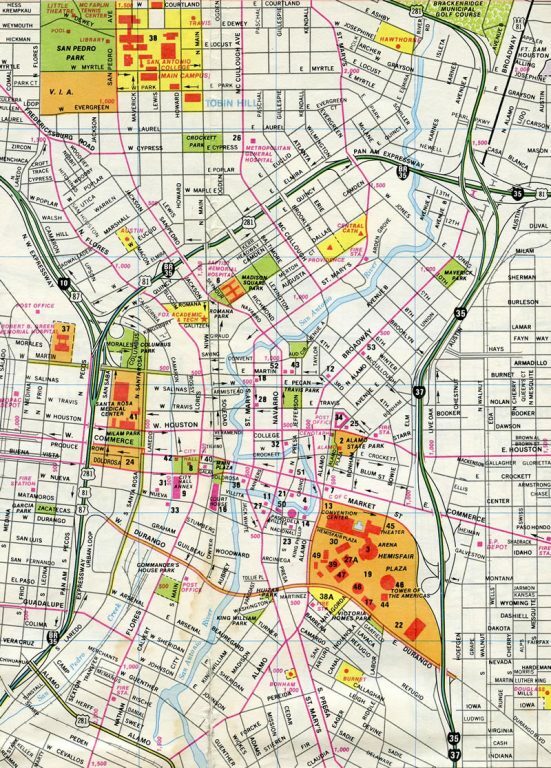 The route followed what is now the IH 35 mainline north along IH 10 & U.S. 87 from Exit 153 and east to the current north end of IH 37 at U.S. 281 at Exit 158.
Business Loop I-35 in San Antonio. 1981 – Continental Map, Inc.
Business Loop I-35H in New Braunfels runs along Schmidt Avenue and Elliott Knox Boulevard (old U.S. 81) between Exits 186 and 190. The route totals 4.49 miles and was designated on March 26, 1991. Established in a mileage transfer from U.S. 81 on June 21, 1990, the route of Business Loop I-35J through Kyle followed Old Highway 81 west from a long split diamond interchange at Exit 213. 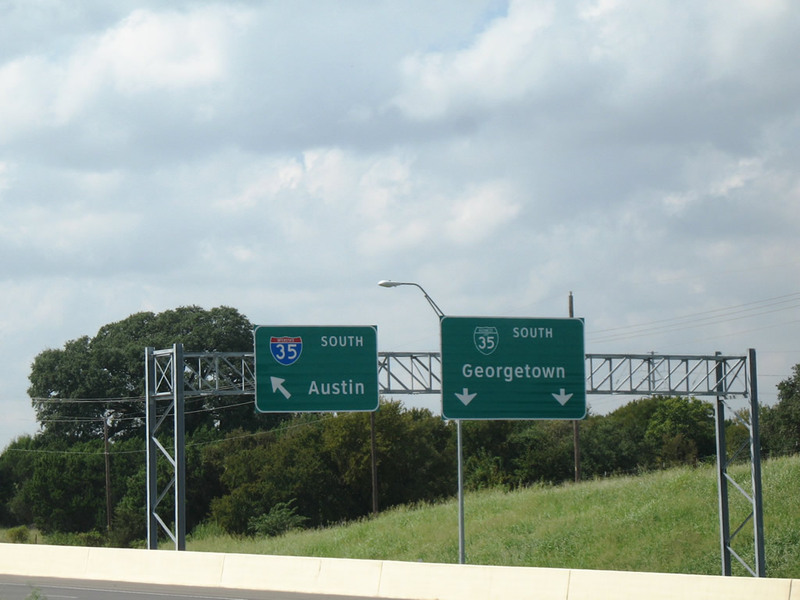 The southbound component looped from on and off-ramps with IH 35 directly, while northbound was not directly accessible from the freeway mainline. Coupled with work north at Kyle Crossing and FM 1626, construction through October 2013 reconfigured Exit 213 and the east-west route of FM 150 through Kyle. Work extended the west side frontage road from Kyle Parkway (FM 1626) south to Kyle. This partially displaced Old Highway 81 (Business Loop I-35) near the original off-ramp from IH 35 south. Phase 2A constructed a new multi-lane alignment for FM 150 curving south from the IH 35 frontage road system at Center Street to the original alignment nearby. Phase 2B relocated the southbound off-ramp one mile to the north and completed the new southbound only frontage road both to FM 150 (Center Street) and the south end of Business Loop I-35. Although now discontinuous along Old Highway 81, Business Loop I-35 is still posted with shields north and south of FM 150 (Center Street). Guide signs from the IH 35 mainline still omit the 1.46 mile route. Business Loop I-35L formerly branched east from IH 35 along Mays Street (old U.S. 81) through the Round Rock city center. The 3.65 mile route was established in a mileage transfer from State Loop 384 on June 21, 1990. It began at a diamond interchange (Exit 250) and ended at a half diamond interchange (Exit 254) with Old Settlers Boulevard (FM 3406). Mays Street south of U.S. 79 was transferred to the city of Round Rock on February 28, 2013. This action coincided with the cancellation of Business Loop I-35L and redesignation of the northernmost 1.4 miles as State Spur 379. Additionally alignment changes were made at both ends of the old business route. The south end was reconfigured during work to build the adjacent interchange with SH 45 North, an east-west toll road, while Mays Street was realigned to the north to no longer end directly across from FM 3406 and the on-ramp to IH 35 north. Business Loop I-35M in Georgetown was a 5.1-mile route signed along Austin Avenue (old U.S. 81) from Exit 259 to a wye interchange at Exit 262. It was commissioned on January 14, 1991.Cancellation of the route occurred by actions on July 6, 2006, when a 1.8 mile segment between RM 2243 (Leander Road) west and RM 2338 (Williams Drive) north was turned over to the city of Georgetown. This left state maintained segments to the south as newly numbered State Spur 26 and the north as State Spur 158. Further changes occurred when RM 2338 was truncated from within the city of Georgetown on July 25, 2008. This left SS 158 with a dangling end at Williams Drive until May 31, 2012, when the 0.2 mile link between Austin Avenue and IH 35 at Exit 261 was added back to the state system. Furthermore, the north end changed with the extension of Lakeway Drive east from Airport Road to SS 158. Located off Interstate 35W within the city of Alvarado, Business Loop I-35V was designated on October 25, 1990 to replace Texas Loop 392. It originates from the frontage road system tieing into County Road 401 and Maple Street at Exit 24. Overlaying old U.S. 81 along Parkway Drive, Business Loop I-35 takes a 2.29 mile route west of the city street grid back to IH 35W north of U.S. 67 (Henderson Street). The north end was previously a full a wye interchange. The route southbound changed in 2013, when the left-hand ramp (Exit 26B) from IH 35 south to Parkway Drive permanently closed. With the ramp removed, Business Loop I-35W south utilizes Exit 26A onto the frontage road south and U.S. 67 east, to make the connection with Parkway Drive south. Signs for Exit 26A were not updated to reflect the business loop. Business Loop I-35X arcs east along 5th Street from Exit 477 (Keaton Road) to the frontage road system at Exit 479. The 1.88 mile long route was transferred from the mileage of State Spur 138 on December 19, 1991. An application submitted to AASHTO outlined a 6.6 mile business route for Interstate 35 at the city of Ottawa. Business Loop I-35 would have angled northeast from Exit 182 along old U.S. 50 (Elm Street) and overlap with U.S. 59 (Main Street) north through Downtown and K-68 east back to I-35 at Exit 187. Construction of Interstate 35 south of Ottawa cut across the old U.S. 50, which crossed paths with the freeway just east of Exit 182. This alignment was eventually removed, as was the wye interchange where it split with U.S. 59 south. The route was disapproved by AASHTO on October 13, 1979. U.S. 50 Business was established along side U.S. 59 north from Exit 183 and east on Keokuk and Logan Streets (K-68) to Exit 187. The Cameron business route from I-35 loops west from the freeway 5.07 miles to join I-35 with Downtown. The route follows Evergreen Street from Exit 52 along a locally maintained road west to U.S. 69 at Walnut Street. U.S. 69 leads both routes north to De Kalb County ahead of Grand Avenue (old U.S. 36). U.S. 36 travels an expressway bypass of Cameron nearby, as Business Loop I-35 joins it east to end at Exit 54. Iowa labeled its first Interstate business route in 1993; it was approved by AASHTO on October 27, 1995. The 8.92 mile alignment originates at the cloverleaf interchange (Exit 111) with the U.S. 30 freeway bypass southeast of Ames. It overlaps with the US route west to U.S. 69 (Duff Avenue) at Exit 148. Duff Avenue constitutes a busy arterial northward as both U.S. 69 & Business Loop I-35 to Lincoln Way (old U.S. 30). Lincoln Way leads the pair west to Grand Avenue while en route to Iowa State University. Grand Avenue takes the route north by Downtown to 13th Street, which carries Business Loop I-35 east to Exit 113. The Clear Lake business route for I-35 was approved by AASHTO on April 16, 1999. The 3.0 mile loop connects the city center with I-35 by way of 4th Avenue (old Iowa 106) and U.S. 18 west from Exits 193 and 194 respectively. The north-south leg follows 8th Street (old Iowa 107). Business Loop I-35 overlaps with the northernmost 6.5 miles of U.S. 65 through Albert Lea. The route winds northwest along an arterial from Exit 8 through the south side of the city to Broadway Avenue. Broadway Avenue leads due north to Downtown, where U.S. 65 & Business Loop I-35 turn east at Main Street (Minnesota 13). Main Street (old U.S. 16) travels across an isthmus between Albert Lea and Fountain Lakes to residential areas of east Albert Lea, where it expands into an expressway. Both routes end at a wye interchange (Exit 12), just south of the I-35 exchange with Interstate 90. This business loop branches east from Interstate 35 along Lyndale Avenue, the pre-freeway alignment of I-35 until 1975,1 through Faribault. The southern half of the 3.6 mile long route is an expressway (CSAH 48) originating at a wye interchange (Exit 55). The northern half doubles as Minnesota 21 between 4th Street NW and a parclo interchange (Exit 59) near Faribault Municipal Airport (FBL). Business Loop I-35 signs were installed around 2006. The north end is marked from the I-35 mainline, while the south end is omitted on guide signs. This business route follows a portion of old U.S. 61 for a distance of approximately 2.9 miles through Pine City while I-35 bypasses the city to the west. 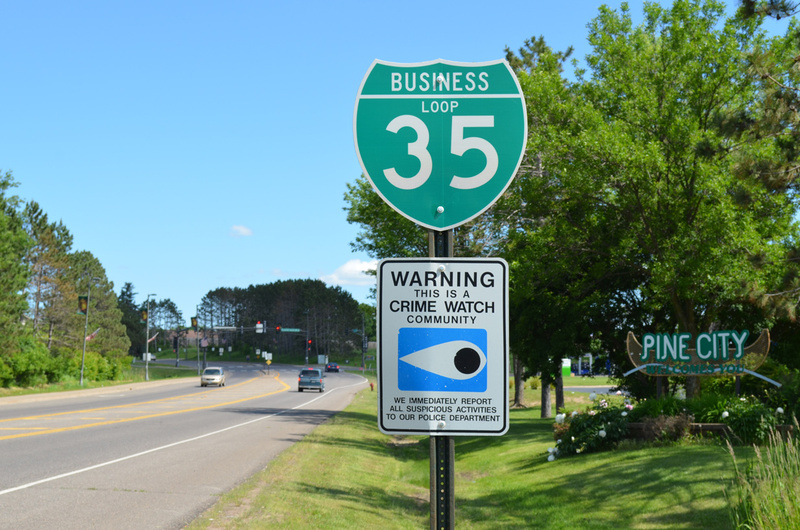 Business Loop I-35 travels east along Hillside Avenue SW (CSAH 7) from Exit 169 to Main Street. Main Street, signed also as Historic U.S. 61, takes the route north through the Pine City business district and across the Snake River to Henriette Road NW (CSAH 11). CSAH 11 leads Business Loop I-35 back to I-35 at Exit 171. Interstate 135 is paralleled by U.S. 81 for nearly its entire length. There are two business routes for U.S. 81 that were intended for Interstate Business Loops. Kansas submitted to AASHTO a 7.3 mile loop west into the city of McPherson for new Business Loop I-135. The route would overlap with K-61 west from Exit 58, U.S. 81 (114th Avenue / Main Street) north to Kansas Avenue, and U.S. 56 east back to I-135 at Exit 60. This was disapproved along with every other Kansas application for an Interstate business route on October 13, 1979. The route instead was posted as U.S. 81 Business, as U.S. 81 overlaps with Interstate 135. Interstate 135 passes well east of the city of Lindsborg through rural Smoky Hill township. An 8.7 mile long business loop was proposed from I-135 between Exits 72 and 78. The route was disapproved by AASHTO on October 13, 1979, but later designated as U.S. 81 Business. It ran west along Smokey Hill Road (CR 429) and north on 14th Avenue (old U.S. 81) into Lindsborg, where it combined with K-4 (McPherson Street) east. K-4 returned U.S. 81 Business to I-135 & U.S. 81 at Bridgeport. U.S. 81 Business to Lindsborg was subsequently decommissioned by 2014. 2003 Faribault Comprehensive Plan http://www.ci.faribault.mn.us/departments/communitydev/planningzoning/compplan. “Pine City’s business loop ready to be experienced by I-35 motorists.” Pine Poker Blog, September 30, 2013.
Business Loop I-35 encircling the west and north sides of the San Antonio central business district while IH 35 overlapped with IH 10 east and IH 37 north to U.S. 281. 1981 – Continental Map, Inc.
SH 46 Business turned north along side Business Loop I-35 (Elliot Knox Boulevard) from Seguin Avenue in New Braunfels. Seguin Avenue south becomes a part of FM 725 across adjacent IH 35. Photo taken by Jeff Royston (08/00). The IH 35 frontage road continued south along side IH 35 to the Georgetown Business Loop as the freeway mainline split with the SH 130 toll road. A sign replacement made here by 2009 removed Business Loop I-35 in favor of SS 158 – NE Inner Loop. Photo taken 09/28/08. Interstate 35 southbound at Business Loop I-35, U.S. 18 west and Iowa 122 east in Clear Lake, Iowa. There were no business route shields posted at the base of the off-ramp. Photo taken 04/23/07.